I would like to dye my blue jeans dark again. Can you tell me the brand of dye that is best for this? 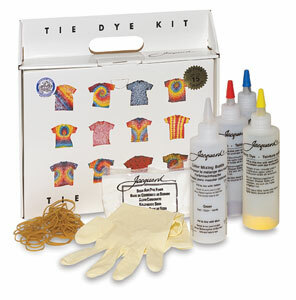 Dylon Permanent Fabric Dye is a permanent dye that gives vibrant colors that won't run or wash out. Specially designed for use by hand in warm water. 1 pack dyes 1/2 lb dry weight fabric. Dyeing larger amounts will give a lighter color. For cotton, linen, ramie and rayon in full shades. Lighter shades on polyester/cotton mixes, wool and silk. Do not dye 100% polyester, acrylic or nylon. 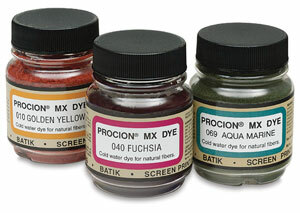 When mixed with soda ash, Procion dyes are permanent, colorfast, and very washable. You can easily create a palette of brilliant colors ranging from light pastels to deep, vibrant hues. Dye up to 15 adult-size T-shirts, with vivid, electric colors that are so colorfast they can be washed with the daily laundry. Ideal for cotton, silk, hemp, and rayon. Message: I would like to dye my blue jeans dark again. Can you tell me the brand of dye that is best for this? Thanks. What I advise is to avoid all-purpose dyes, such as Rit dye, because their color fades quickly and ruins anything you wash in the same laundry load with it. There are much higher-quality dyes available. If you use a fiber reactive dye, then, after you've washed out all of the excess unattached dye, the color will last and last. Fiber reactive dyes on cotton can easily keep their color twenty times as long as all-purpose dyes, because they don't run in the laundry. After the initial washing-out, you can launder dark clothing dyed with fiber reactive dye in the same load as white clothing without any color transfer, even in hot water. There are two different dyes that I recommend for you to consider, both fiber reactive dyes. The easiest-to-find may be the Dylon Permanent Dye. My local Joann's fabric store carries this, and crafts stores often do, too. You'll need two envelopes of this dye to dye a one-pound pair of jeans, more if they are heavier. Read and follow the directions on the side closely. You will need a small plastic bucket to immerse the jeans in the dye in; Dylon Permanent Dye is not packaged in quantities suitable for a washing machine. This dye requires hot tap water to work, but it is a good fiber reactive dye that stays bright (or dark) for a long time. You'll have to wash the jeans you dye separately in hot water a couple times to get all the excess dye out, but then after that the dye that remains will not run at all. Dylon Permanent Dye comes with the dye fixative already included in the mixture; you may need to add some salt, but that's all. The other dye I recommend is Procion MX dye. It's very similar to the Dylon Permanent dye in how easy it is to apply and how long it lasts, but it is harder to find in local stores, and it is available in at least ten times as many different pre-mixed colors. If you can't find this dye locally, you can order it online; see my page of "Sources for Dyeing Supplies Around the World". The dye fixative is not included in the dye mixture, which makes it more versatile and less expensive; this means you have to buy the soda ash or washing soda separately. Since you can measure out however much dye and washing soda you need, you can use Procion MX dye to do your dyeing in a washing machine, if you like. This saves a lot of stirring and produces a more perfectly solid color. You will need to find a good recipe and, as with the Dylon dye, follow the recipe closely. See my page, "How can I dye clothing or fabric in the washing machine?". You can also use Procion MX dye in many other ways, for tie-dyeing, shibori, dye painting, low water immersion dyeing, and others. Unlike Dylon Permanent Dye, it can be used at room temperature, which makes it a tremendously versatile choice of dye. All of this advice assumes that your jeans are mostly cotton. It's okay if they contain a little spandex, as long as they are mostly cotton. If they are a poly-cotton blend, it's a different question, with a different answer. Follow this blog on twitter here.